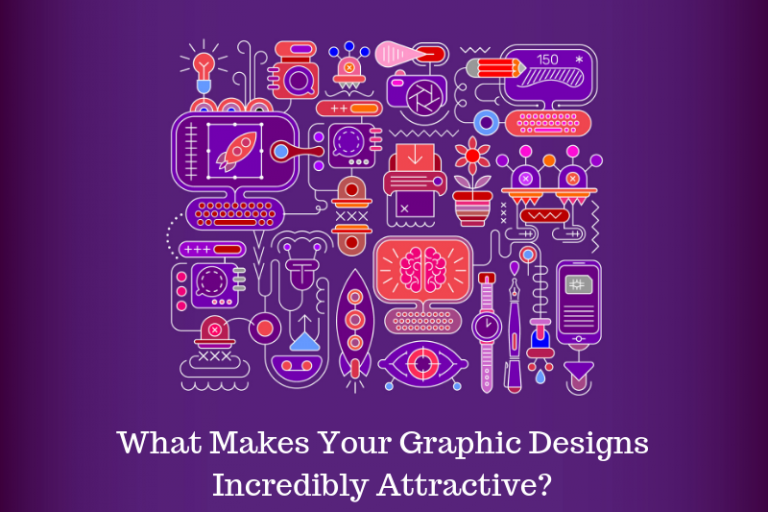 As a designer of any kind, you probably use Adobe Photoshop, and the Adobe suite in general, to earn your living. 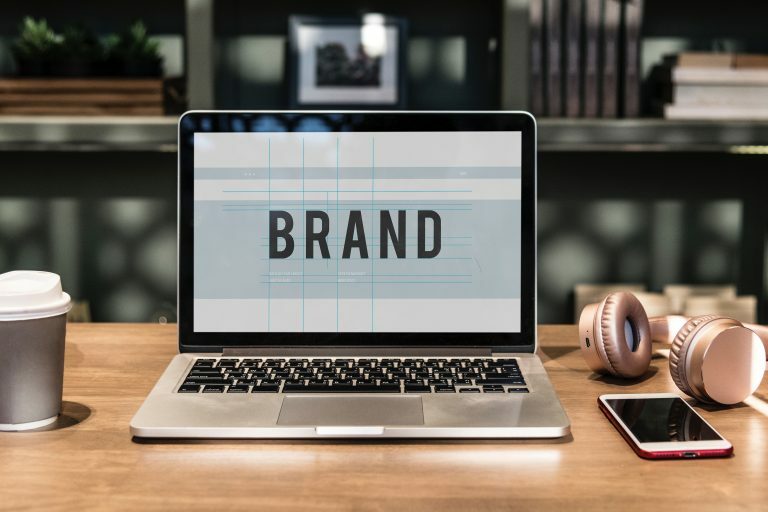 Whether you are designing logos, icons, websites, patterns etc., you sit down in front of your computer and double-click the Photoshop icon, a task that, by now, you can probably do with your eyes closed. 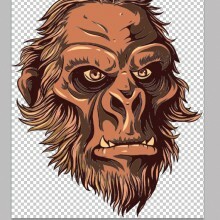 Work is work, no matter how you look at it, and work has a tendency of becoming tedious. That’s because, if you fancy yourself as an artist, what you are doing there is not really an expression of yourself or a thoughtful piece, made to make people think about social, political or philosophical issues, and yes, we know that sounded really pretentious. 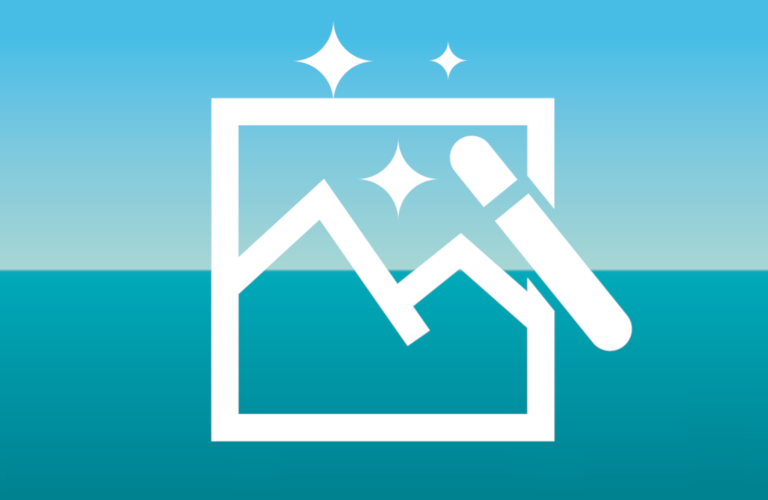 The beauty of Adobe Photoshop is that you can also use it to create art, and make no mistake, Adobe Photoshop has made the creation of art so much more accessible. We have already shown you another artist that uses pop culture as the basis for her art, and today we’ll be showing you David Barton’s (better known as Limpfish) pop art paintings made in Photoshop. Aside from the fact he is British and talented, it’s pretty hard to know anything else for certain about the artist by looking at the “About me” section from his website, so what we are going to do today is a little speculative work, based on the words we can actually see. That means that not a lot, if any, of the information we are going to be giving here can be considered in any way factual, but we hope that it will at least be funny. David Barton is a British artist, born sometime in the 20th century (that’s a fact). By randomly picking a city in the United Kingdom, we’ve established that his home town is Truro, a small town of almost 20, 000 inhabitants in Cornwall, England. Fun facts about the town: it is the southernmost city in Mainland Great Britain, and the people there are called Trurorians. He currently lives in what might as well be Los Angeles, for all we know, where he works as an Artist, Graphic Designer, Basket Weaver and Information Systems Engineer. Sometime between 1990 and 1999, he got his Bachelor’s Degree in something similar to his L.A.-based activities, from the University of Strathclyde, in Glasgow, Scotland. Other famous alumni of this university are John Logie Baird, who invented the first working television; David Livingstone, the famous explorer and missionary; and James Young, who successfully separated paraffin wax, naphtha, lamp oil and lubricating oil from oil. Possibly (though improbably) inspired by John Logie Baird, Limpfish creates stunning works using Adobe Photoshop, Corel Painter and a crayon, depicting pop culture icons in famous paintings. Let’s take a look at his Photoshop masterpieces, and talk about them as we go along. 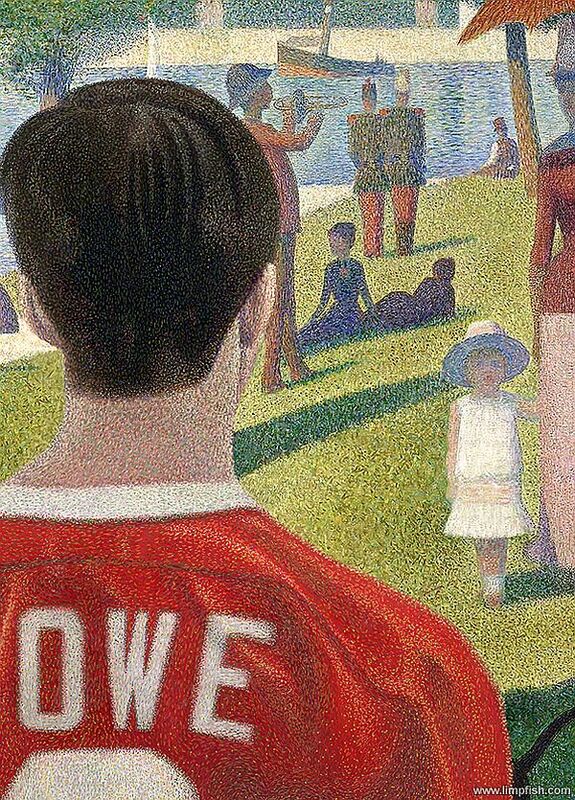 Here we have what appears to be a football player, possibly from Liverpool, possibly staring really intently at a couple of maybe-guards, put inside Georges Seurat’s famous A Monday Morning in Chicago. What really makes this painting funny is imagining the face the possible-footballer has. Perhaps he is staring blankly at the water, perhaps his staring down the authorities. The choice is entirely yours to make. Claude Monet is definitely one of the most famous Impressionist painters ever, and Woman with a Parasol is undoubtedly his most famous work. Darth Vader, in turn, is one of the most iconic villains in movie history, from one of the most iconic films in movie history. 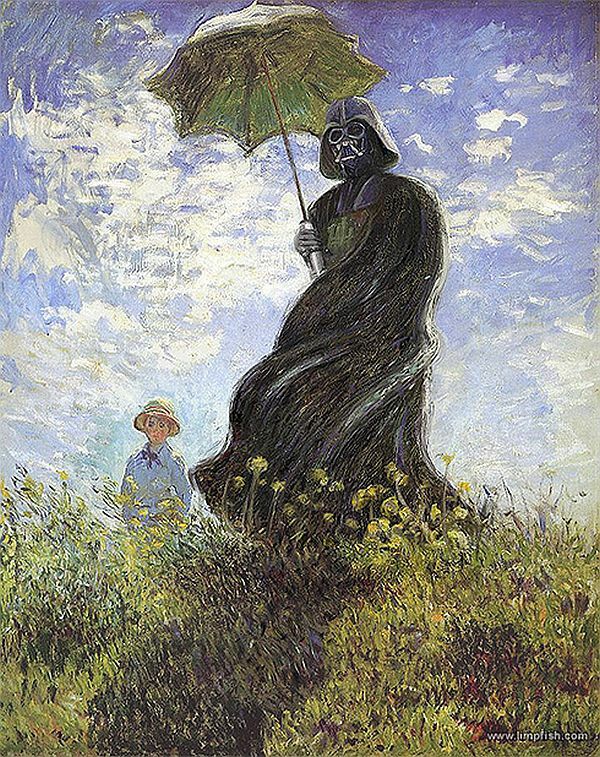 What Vader is not exactly renowned for is what a great father he was, and therein lies the humor of this image. We don’t know what, if any, famous painting this is supposed to be poking fun at. So, if you know, please don’t keep it to yourself, and tell us in the comment section. We think it most resembles the George Clooney Batman (from the camp-fest that was Joel Schumacher’s Batman & Robin), only fatter and more unkept. 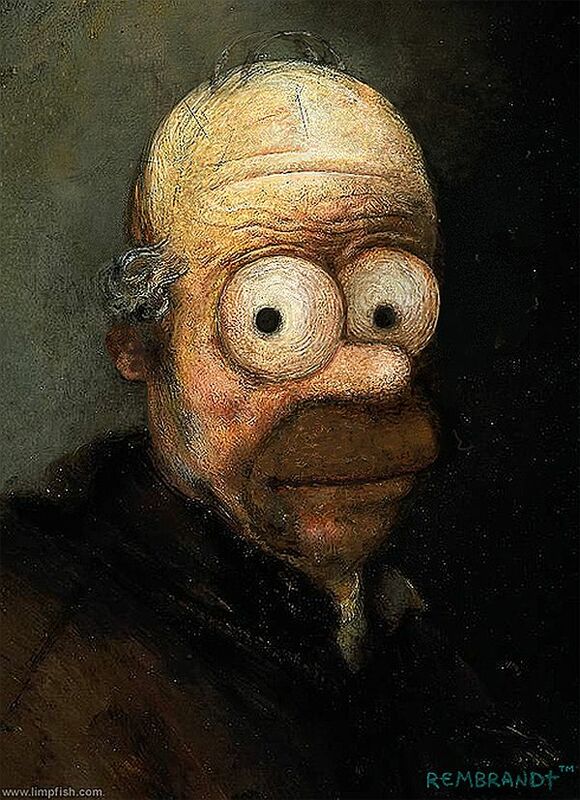 Rembrandt was famous for his portraits, and is one of a selected few painters that was successful during his life time, so it is really anyone’s guess as to which specific portrait this one of Homer Simpson is. We can say for sure that is not Slaughtered Ox (yes, we know it probably isn’t done by Rembrandt, but by one of his pupils. 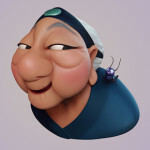 Just roll with it). The next few of entries will all feature characters from The Simpson’s, so it is perhaps safe to assume that David is rather a fan of Matt Groening’s long running animated sitcom. 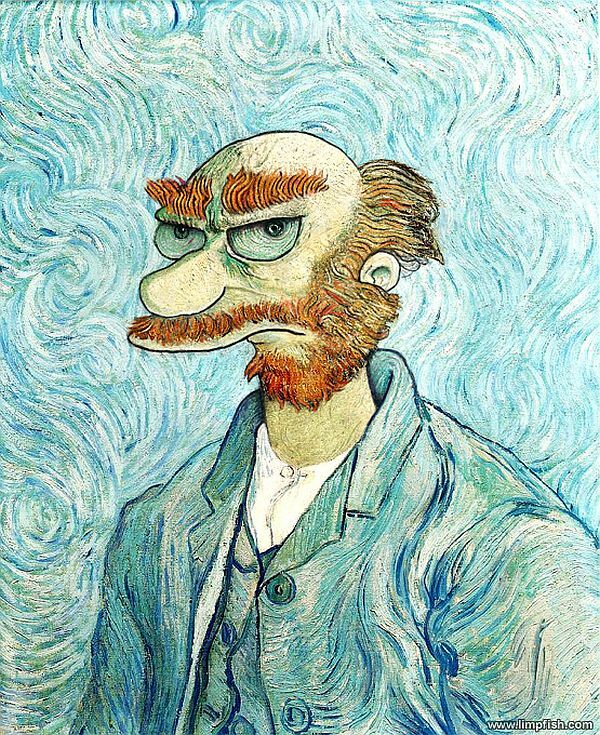 Here we have fan-favorite Groundskeeper Willie, the Scottish janitor of Springfield Elementary School, depicted as Vincent Van Gogh, the renowned Dutch painter, in his famous self-portrait. It’s really great work, but he definitely missed a golden opportunity by not cutting Willie’s ear off. Now, understanding the subtle reference to another painting by the same artist requires either solid knowledge of Vermeer’s work, or a Google search. 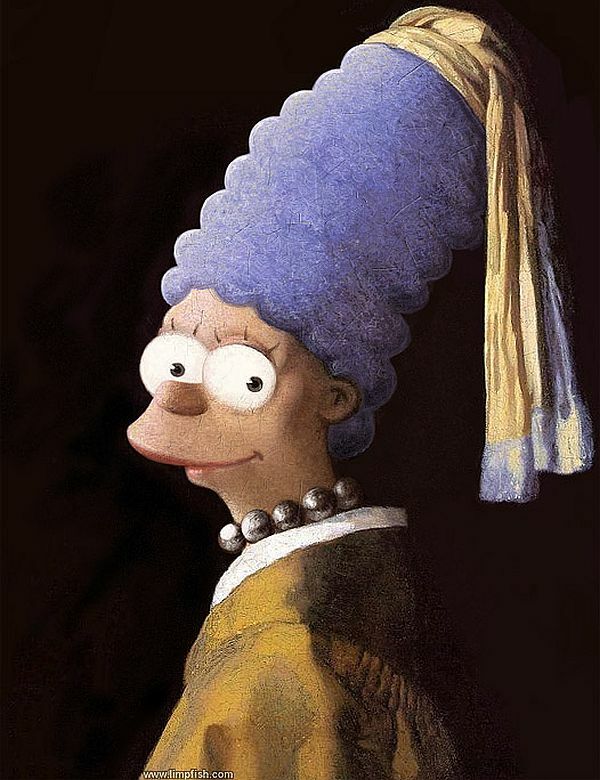 See, here you can instantly recognize Marge Simpson as “Girl with a Pearl Earring”, by far Vermeer’s most famous painting, thanks to the movie with the same name, starring Scarlett Johansson. 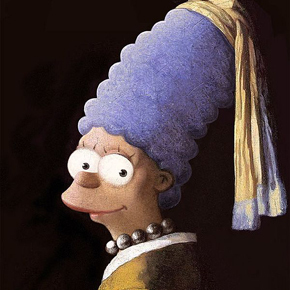 But as you have maybe noticed, Marge isn’t wearing any earrings, but she is wearing a pearl necklace, and Woman with a Pearl Necklace is another painting by the Dutch painter. Dali is probably by far the most eccentric artist in recent history. 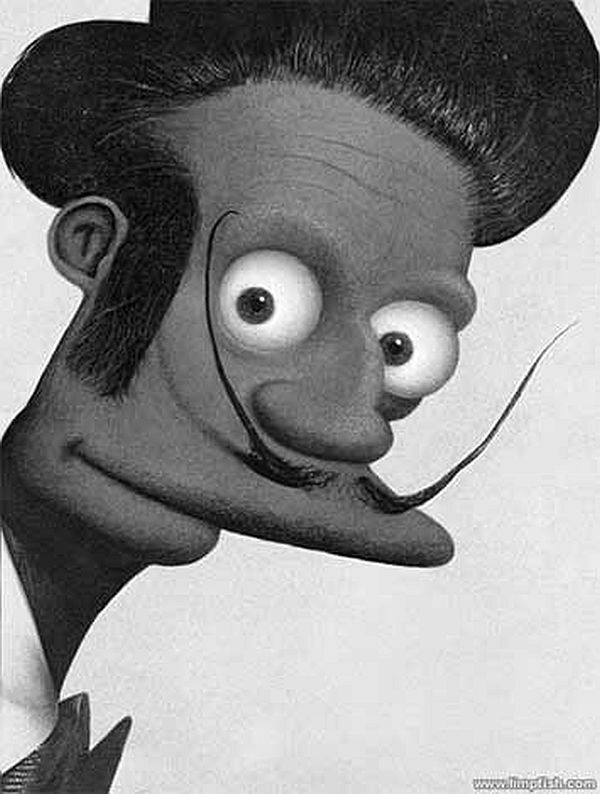 A walking paradox that graced art and history with his presence, and revolutionized the way we look at facial hair. Apu hasn’t really revolutionized anything, but he is, nonetheless, one of the most iconic Simpsons characters. This is pretty much a straightforward reinterpretation of the classic American Modernist painting, by Grant Wood. 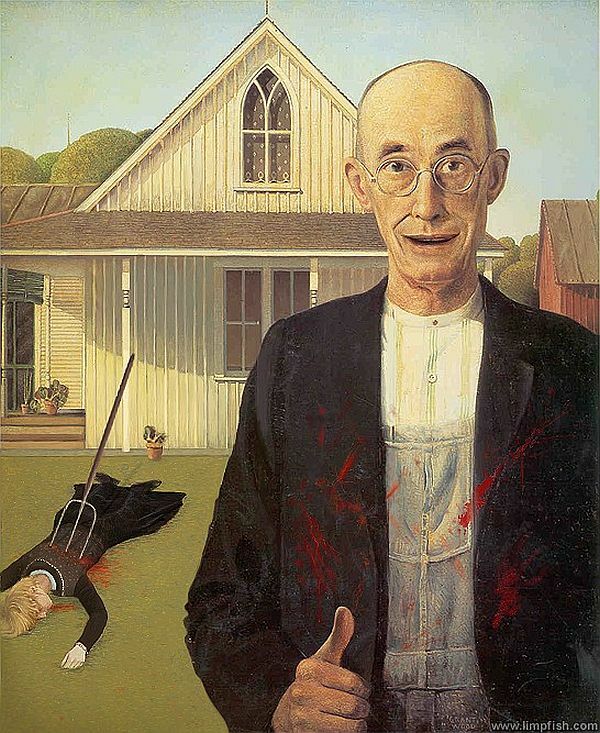 It depicts the farmer from the original “loosing it”, so to speak, and killing his daughter (yes, that was supposed to be his daughter). You’d think that this isn’t exactly pop culture, but the famous painting has been referenced throughout several mediums, including TV, and further including, you guessed it, The Simpsons. That concludes our article on Limpfish. It was a real pleasure for us to look and talk about his work, and we hope you enjoyed it. Don’t forget to check out his website if you want to see more of his stuff, including some photos he takes, and some of his older stuff, dating as far back as 1999. Don’t forget to tell us what you thought about the article, in the comment section below. Seurat’s Monday Morning in Chicago is a reference to the movie Ferris Bueller’s Day Off. During their adventures in Chicago while ditching school, one of the sites they go to is the Art Institute in Chicago. The “footballer” is Cameron in his Gordie Howe Detroit Red Wings (hockey) jersey. These are great! 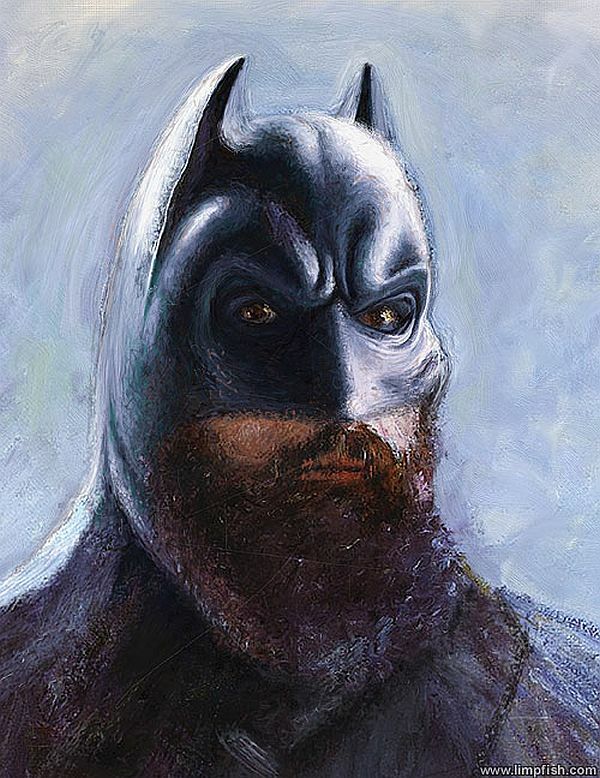 The Batman painting is a send-off of Claude Monet’s “Self Portrait with a Beret” 1886. I knew my art history class would come in handy one day.